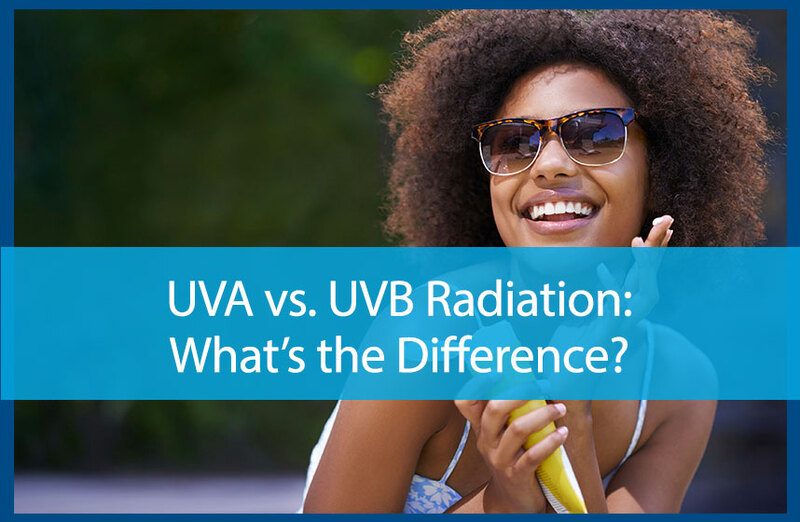 UVA vs. UVB Radiation: What’s the Difference? Sunshine can provide plenty of benefits for the skin and overall health; but as just about everyone knows, too much exposure to the sun’s ultraviolet rays can be harmful, triggering premature aging, contributing to some types of vision loss, and even increasing the risk of skin cancer. Ultraviolet light is part of the electromagnetic spectrum, which includes all types of energy, including microwave and radio waves, visible light and radiation energy like ultraviolet rays, X-rays, and gamma rays. Some of the energy that comes from the sun (including a third type of UV energy called UVC) is absorbed by the protective ozone layer, and of course, the sun’s visible light rays help us see. The longer wavelengths of UVA and UVB enable these energy waves to reach the earth and become absorbed by the skin. When absorbed by the skin, UV radiation causes genetic mutations in the skin cells that can eventually lead to cancer; in fact, UV energy is the leading cause of both squamous cell and basal cell cancers, and researchers believe UV exposure also plays a role in the development of melanoma, a very deadly type of skin cancer. UVA rays tend to be less intense than UVB rays, but they’re far more prevalent, comprising about 95 percent of the UV radiation that penetrates the earth’s atmosphere. In fact, while UVB rays are most intense during the hours of 10 a.m. to 2 p.m., UVA rays remain quite significant throughout all daylight hours, which means it’s important to remain adequately protected any time you’re outdoors. Differences in wavelengths between UVA (which has a slightly longer wavelength) and UVB mean they tend to damage different layers of the skin and are associated with different types of damage. For years, researchers have recognized that UVA rays play a major role in photo aging, including wrinkling and pigmentation issues like sunspots. But until recently, the role of UVA in skin cancer development was not widely understood. Now, scientists know UVA radiation can penetrate to the deeper layers of the skin, where it may actually trigger or contribute to genetic mutations that cause cancer. This is particularly important information, as most tanning beds rely on UV-A and often tout this as “non-burning” ultraviolet. While it’s true that UV-A does not cause sunburns, it’s now clearly recognized as increasing the risk of skin cancer. There is no such thing as a “safe” tanning bed. For years, researchers thought skin cancer was associated primarily with UVB exposure, and it’s true – UVB exposure does play a significant role in the development and growth of these cancers. UVB rays penetrate the most superficial layers of the skin where they cause visible damage like sunburns. Like UVA, UVB exposure can also contribute to photo-aging effects, but to a lesser extent. Wear protective clothing when in the sun. Apply protective film to home, office and car windows to prevent UVA rays from entering. Seek shade (or stay indoors) from 10 a.m. to 2 p.m.
Have regular skin cancer screenings every year. To learn more about your risks for skin cancer or to schedule a skin cancer screening, call Avail Dermatology today at 770-251-5111.
https://availdermatology.com/wp-content/uploads/2017/01/raysssss.jpg 560 858 John Lenz /wp-content/uploads/2017/08/logo.png John Lenz2017-01-27 15:49:152017-10-20 14:51:17UVA vs. UVB Radiation: What's the Difference?